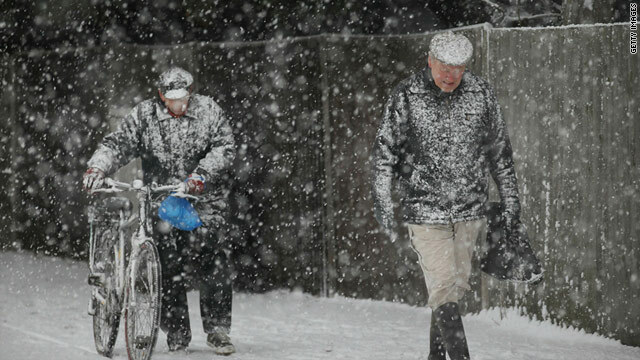 Wow, snow is wreaking havoc in places where it technically shouldn't be! Boo hoo, we've got several feet of it up here in edmonton, alberta! It's been like this every winter since i moved here 31 years ago, buy a canada goose jacket, some north face boots and deal with it princesses! Mother nature is finally spreadimg around what she's been saving for us for so many years! I love it! Years ago I read a very sensible aeticle that said the extremes in the weather would become more, well, extreme and while this activity would be xery obvious, the warming of the planet would creep farther upward. They seemto have been right. And. Another person said we should watch what is going on in our own back yard. Wished I would have done that. Mine is full of mercury,put there intentionlly by politically connected greedy criminals. Ask me if I am going to vote for the next republic0an presidential candidate! Look and see what countries are generally warm and snuggly right now, and those are the countries that are using weather weapons against the rest of us. Of course, the next logical step would be to invade and conquer them. Seriously, the world is experiencing a simple statistical anomaly with the weather right now. It's when these anomalies increase in frequency that we should take pause. We shouldn't simply allow these anomalies to become the new norm, without seriously considering the role humankind has to play, and taking what steps we can to protect future generations. No snow yet in Philly, just some flurries last week that didn't last a day. Hearing about the snow up in New England makes me nervous though since I have to drive up there on Thursday for the holiday. Portland, Oregon weather is the same as it is the other 9 months out of every rainy season... rainy. Declaring global warming as a worrisome anthropogenic effect based on CO2 in the presence of so much water vapor is a scientific fraud and a hoax. The last 50 years of this house of cards is now tumbling down as the Earth cools for the next 100 years. CO2 latent heat is less than air and not even half of that for water vapor. A few tenths of a degree warming over a century is way too wimpy. We are now in a Landscheidt minimum with global cooling expected into the next century. Water vapor is a unique GHG in that it can cool also by raining, cloud formation and snowing. So, during this long term cooling, a lot of the GHE from water vapor is going to be lost to the massive increase in cold dry air. Besides, mankind will run out of fossil fuel in the near distant future and this whole thing becomes a mute point. Absolutely incorrect. What cooling? Besides, water vapor remains relatively constant throughout the years and falls out of the atmosphere pretty quickly. CO2 is a much more intense greenhouse gas and stays in the atmosphere for much longer periods of time – it only takes a small amount of CO2 to change temperature, while it takes massive amounts of water vapor to do the same thing. While the amount of CO2 in the atmosphere is small, it's enough to keep the planet warm enough to be habitable. It's basic chemistry and physics. Sunny in New York City with temperatures hovering around freezing (32 F/ 0 C) so it's not bad weather here.